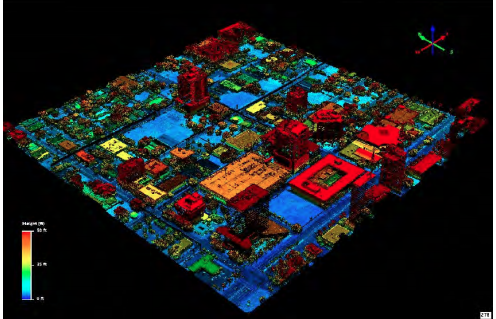 This is a high-density topographical map of the city of Fort Lauderdale using LiDAR technology, (light detection and ranging.) The topography and seawall studies of the city were done for the Stormwater Master Plan. The city of Fort Lauderdale released a long-awaited study Thursday about the status of its stormwater and drainage systems. In an update to the city's Stormwater Master Plan, Hazen and Sawyer P.C., the company that won the contract to manage the master plan, laid out recommendations for fixing pipes in the city's seven high-priority neighborhoods: Progresso Village, Victoria Park, Dorsey Riverbend, Southeast Isles, River Oaks, Edgewood and Durrs. 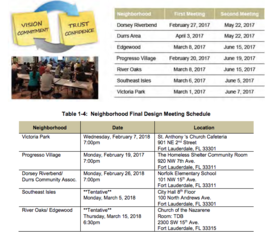 Those updates to the master plans and final designs - and costs - for each neighborhood will be presented to residents at tentatively-scheduled meetings throughout 2018. The Dorsey Riverbend neighborhood currently has its stormwater collected by two city-owned collection systems, an FDOT collection system and private collection systems. The study shows many of the area’s pipes are too small for the area that they drain. In Durrs, the study found that most of the neighborhood’s pipes were built and installed between the 1940’s and the 1970s. They are too old to continue to drain the area the way they should. Progresso Village, which runs between West Sunrise Boulevard and West Sistrunk Boulevard, has a different problem with its pipes. Design improvements aimed to reduce flooding in this area of the city, include filling in low points in roads and creating more storage areas like swales to catch stormwater runoff. Roads flood often in Victoria Park, and according to the study, the neighborhood is already built out. This means any changes to the pipe systems will have to be an expansion of what’s already in place and include building a new stormwater pump station. Most of the current stormwater and drainage in Edgewood is not in the residential part of the area. The neighborhood was designed originally for swale drainage, which isn’t working properly, according to the study. Many of the pipes are too small for the parts of the neighborhood they serve. There are multiple drainage systems in place for the River Oaks neighborhood. Swales here, like in Edgewood, aren’t working the way they were designed to, the study details, causing much of the flooding. Southeast Isles mostly drains its stormwater directly into the area’s canals. The Stormwater Master Plan aims to install around 100 tidal valves to control flooding here. Regarding other infrastructure fixes, the City Commission voted in late January to borrow $200 million to start fixing the city's over-burdened sewage pipes.